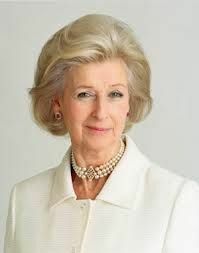 Princess Alexandra, The Honourable Lady Ogilvy KG, GCVO (Alexandra Helen Elizabeth Olga Christabel; born 25 December 1936) is the youngest granddaughter of King George V and Mary of Teck. She is the widow of Sir Angus Ogilvy. Prior to her marriage she was known as Princess Alexandra of Kent, being the first princess to use the territorial designation of Kent since Princess Alexandrina Victoria of Kent's accession as Queen Victoria. Princess Alexandra carries out royal duties on behalf of her cousin, Queen Elizabeth II. As of the birth of Lady Rose Gilman's son in 2012, she is 42nd in the line of succession to the thrones of 16 states; at the time of her birth in 1936, she was 6th. Princess Alexandra was born on 25 December 1936 at 3 Belgrave Square, London. Her father was The Prince George, Duke of Kent, the fourth son of George V and Queen Mary. Her mother was Princess Marina of Greece and Denmark, a daughter of Prince Nicholas of Greece and Denmark and Grand Duchess Elena Vladimirovna of Russia. She was named after her great-grandmother, Queen Alexandra, her maternal grandmother, Princess Nicholas of Greece and Denmark, and both of her maternal aunts, Countess Karl Theodor of Törring-Jettenbach and Princess Paul of Yugoslavia. She received the name Christabel because she was born on Christmas Day like her aunt by marriage Princess Alice, Duchess of Gloucester. As a male-line granddaughter of the British monarch, she was styled as a British princess with the prefix Her Royal Highness. At the time of her birth, she was sixth in the line of succession to the British Throne. The Princess was baptised in the Private Chapel of Buckingham Palace, on 9 February 1937, and her godparents were: King George VI and Queen Elizabeth (her paternal uncle and aunt); the Queen of Norway (her grandaunt); Princess Nicholas of Greece and Denmark (her maternal grandmother); Princess Olga of Yugoslavia (her maternal aunt); the Princess Beatrice (her paternal great-grandaunt); the Earl of Athlone (her paternal granduncle); and count Karl Theodor of Toerring-Jettenbach (her maternal uncle by marriage). Of her godparents, only the King and Queen and Lord Athlone were present. Princess Alexandra spent most of her childhood at her family's country house, Coppins, in Buckinghamshire. She lived with her grandmother Queen Mary, the widow of George V, during World War II at Badminton. Her father was killed in an airplane crash near Caithness, Scotland on 25 August 1942 while serving in the Royal Air Force. Princess Alexandra has the distinction of being the first British princess to have attended an ordinary – albeit independent, fee-paying – school, Heathfield School near Ascot. She served as bridesmaid at the wedding of her cousins, the then-Princess Elizabeth and The Duke of Edinburgh, on 20 November 1947. The Queen is Princess Alexandra's paternal first cousin; The Duke of Edinburgh is Princess Alexandra's maternal first cousin once removed. The Duke and Princess Marina were first cousins. She was also a bridesmaid at the 1962 wedding of Prince Juan Carlos of Spain and Princess Sophia of Greece and Denmark. The Spanish Queen and Princess Alexandra are second cousins. James Ogilvy, born Thatched House Lodge, 29 February 1964; married, 30 July 1988, Julia Rawlinson; had issue. Flora Alexandra Ogilvy, born 15 December 1994. Alexander Charles Ogilvy, born 12 November 1996. Marina Victoria Alexandra Ogilvy, born Thatched House Lodge, 31 July 1966; married, Richmond Park, Surrey, 2 February 1990, Paul Julian Mowatt, born London, 28 November 1962; divorced 4 December 1997; had issue. Zenouska May Mowatt, born London, 26 May 1990. Christian Alexander Mowatt, born London, 4 June 1993. Since the late 1950s, Princess Alexandra has carried out an extensive program of royal engagements in support of the Queen, both in the United Kingdom and overseas. Taking part in roughly 120 engagements each year, Princess Alexandra is one of the most active members of the Royal Family. Princess Alexandra was 15 years old when her cousin acceded to the throne. It has been customary for eldest sons to carry out official duties which are included in the Court Circular. Princess Alexandra was asked by the Queen to undertake such duties because of a lack of female members of the family. The only other princesses by birth were the Queen's sister Margaret, the Queen's young daughter, Princess Anne and the Queen's great-aunt Princess Alice, Countess of Athlone. In 1959, she carried out an extensive tour of Australia, and attended the Queensland Centenary Celebrations. She returned to the country in 1967 for a private holiday, but also carried out engagements in Canberra and Melbourne. Princess Alexandra represented the Queen when Nigeria gained its independence from the United Kingdomon 1 October 1960, and opened the first Parliament on 3 October. Later overseas tours included visits to Canada, Italy, Oman, Hungary, Norway, Thailand, Gibraltar and the Falkland Islands. During her visit to Hong Kong in 1961, Princess Alexandra greets Cantonese opera performers Yam Kim-fai and Bak Sheut-sin after their performance of The Romance of the White Snake. 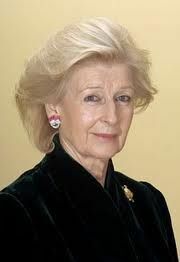 Princess Alexandra served as Chancellor of Lancaster University from its foundation in 1964 until she relinquished the post in 2005 (when she also accepted an honorary degree in Music). She is also an honorary fellow of the Royal College of Physicians and Surgeons of Glasgow, of the Royal College of Anesthetists, the Royal College of Obstetricians and Gynecologists, and the Royal College of Physicians. She is also the President of Alexandra Rose Day, which was founded in honour of her great-grandmother, Alexandra of Denmark. She has recently given up the patronage of The Royal School, Hampstead, which was founded in 1855. The new Patron of the School is The Duchess of Cornwall. Princess Alexandra receives £225,000 per year from the Civil List to cover the cost of official expenses; although like with the other members of the Royal Family (except the Duke of Edinburgh) the Queen repays this amount to the Treasury. Alexandra lives at Thatched House Lodge in Richmond, London, and a Crown property purchased on a 150-year lease from the Crown Estate Commissioners by Sir Angus Ogilvy after their wedding in 1963.. It was reported in the London Evening Standard on 11 January 2006 that, as a widow living alone, Princess Alexandra felt that the seven-bedroom house was too full of memories and that she wanted to sell her lease. However, to date she continues to live there. She also has use of a grace-and-favour apartment at St James's Palace in London. Her husband supported Alexandra in Royal duties at times, although he also had an independent career. She is the patron of the Blackie Foundation Trust, a charity dedicated to the promotion of research and education in homoeopathy. She is also a patron of the English National Opera; the London Philharmonic Choir; the not-for-profit housing association Anchor; the charity Independent Age; St Christopher's Hospice in Sydenham, England; Core, a National charity in London dedicated to funding research into digestive diseases and which also publishes information leaflets on the most common diseases of the gut and liver; the Nature in Art Trustand London Academy of Music and Dramatic Art (LAMDA), the oldest drama school in the English-speaking world. The Princess is president of WWF-UK. She has been the patron of the Royal Alexandra Hospital for Sick Children in Brighton since 1954. She is also the Royal Patron of Children and Families Across Borders, a charity dedicated to reuniting children who have been separated from their families. She is patron of Central School of Speech and Drama which received Royal title in 2012 as part of Her Majesty The Queen's Diamond Jubilee. Described as "one of the most popular members of the royal family", Princess Alexandra and her family have come under media scrutiny at various times in her life. Her husband was a director at a mining company, Lonrho, when it was involved in a scandal over the breaking of trade sanctions against Rhodesia. The Prime Minister at the time, Edward Heath, criticised the company, and Ogilvy subsequently resigned his directorships from that company. Her full style is Her Royal Highness Princess Alexandra Helen Elizabeth Olga Christabel, The Honourable Lady Ogilvy, Royal Lady of the Most Noble Order of the Garter, Dame Grand Cross of the Royal Victorian Order.